Seeing as how my husband Jeff has a monthly pizza “guest post” on this blog, you’d think he’s the only one in our household who makes pizza. But that’s not true. I whipped up some mini pizzas for you today, AND a leftover pasta bowl using the same ingredients that you can pack for lunch tomorrow. Do Jeff’s pizza recipes come with leftover ideas? I think not. There are so many great vegetables in season in the summer that sometimes I feel like I want to have five different vegetable side dishes at any given dinner. One strategy to eating a ton of veggies is to pile them all on a pizza – then there’s no need for side dishes! Here, I’ve kept it to just my two summer favorites – corn and zucchini. I took a little help from the store with pre-made mini pizza crusts, then topped those with creamy ricotta cheese. 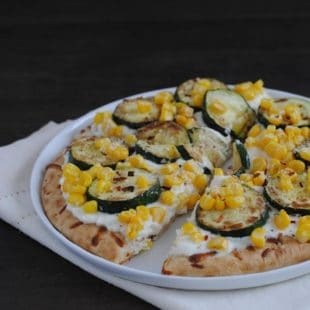 Corn and sautéed zucchini are piled on top, and the pizzas can be garnished as desired by each family member – Parmesan cheese, red pepper flakes, freshly cracked black pepper – or all three. As a bonus recipe, I’ve created a pasta bowl for lunch the next day from leftover pizza toppings! “Cook once, eat twice” should be every busy family’s motto. 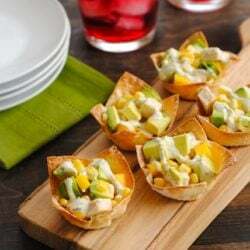 For a fun family meal like mini pizzas, try Re-Play feeding essentials. They’re made in the USA, from recycled milk jugs. They’re a great option for parents who want to make the planet a better place for their children as well as future generations. All Re-Play items are made from curbside collected HDPE plastic (the power of recycling!). The recycled plastic is FDA approved food grade material, and both the products themselves and the minimal packaging are suitable for recycling (again!). Re-Play products are sold through their online shop as well as Amazon. They can also be found at Whole Foods and specialty shops around the country. 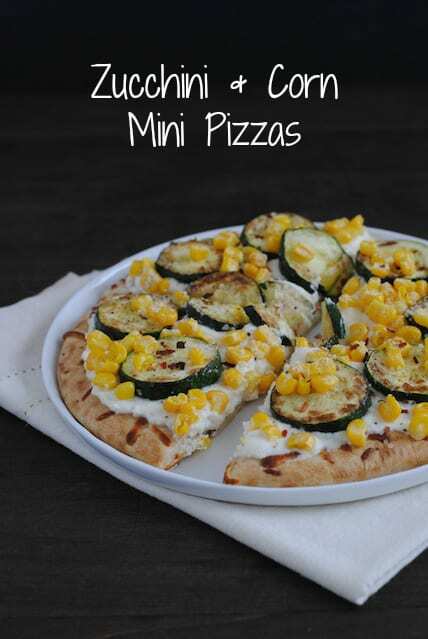 Make the Zucchini & Corn Mini Pizzas: Preheat oven to 350 degrees F. In large skillet, heat oil over medium-high heat. Add zucchini and cook 4 to 6 minutes or until zucchini is golden brown, stirring and turning occasionally. Remove from heat; season with salt. Place pizza crusts on rimmed baking pan. Spread each pizza crust with 1/3 cup ricotta. Top with 1/2 of zucchini and 1/2 of corn. Cover and refrigerate remaining zucchini, corn and ricotta. Transfer pizzas to oven; bake 5 minutes or until everything is heated through. Cut each pizza into 4 pieces and serve garnished with Parmesan, black pepper and/or red pepper flakes, if desired. 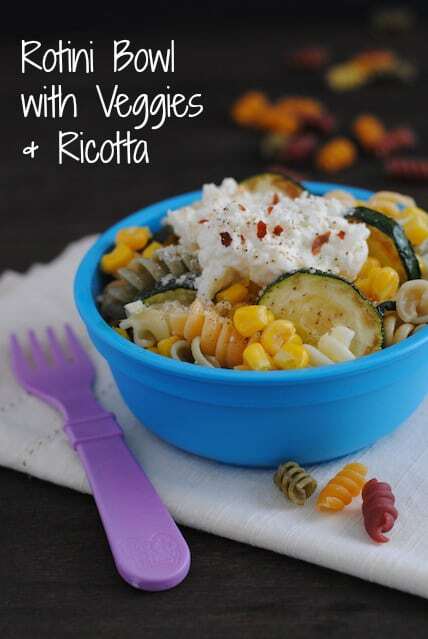 Make the Leftover Rotini Bowls with Veggies & Ricotta: Cook rotini according to package instructions. Divide between 4 lunch containers; divide remaining zucchini, corn and ricotta over pasta. When ready to eat, reheat in microwave and serve garnished with Parmesan, black pepper and/or red pepper flakes, if desired. 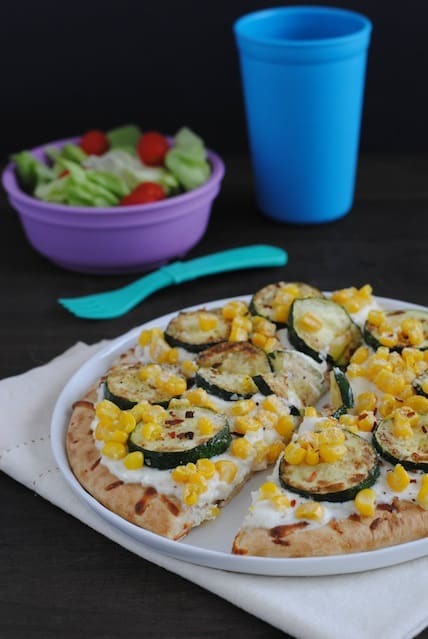 Yes to corn and zucchini! Especially because in a few weeks I’m going to have so much corn I won’t know what to do with it all. You definitely triumph over Jeff with this two meal recipe, Lori. Tell him I said so 😉 Now that it’s hot out, all I want to eat is fresh, light vegetables (gasp – that’s so weird coming out of my mouth!). Your pizza and pasta both look fantastic! I eat corn like it’s nobody’s business every summer. Those pizzas look really good. I am bummed you didn’t share … FYI, sharing the delicious is a staple of the Jeff guest pizza posts. 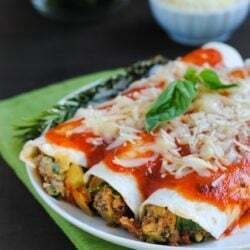 This is a healthy pizza recipe, which I like! Corn and zucchini work well together :). Oh, you totally will! I think one week in my CSA, I got 16 ears of corn. SIXTEEN. For two of us. Corn soup, it was! Ohhhh…shush. You were probably off golfing or something. Haha, well, that’s totally allowed Susan. Just skip right to the leftover recipe 🙂 And, my job kind of requires me to be creative with leftovers, because I ALWAYS have them around! I did a zucchini round up today, and I featured the pizza. This is a great way to use the overabundance of summer vegetables covering my counter and pouring into my fridge. Thanks! Hello there Lori! May I use this in a “Foodie Families Feeding Kids” roundup I’m working on? Hi Christine – definitely! Thanks so much.